Project thinking has been the leading cultural framework within software development companies for the last half of century. The market, regardless of industry, has developed to a point where each following release must be done swiftly. Developers responded accordingly: there's a scope, a set budget and a vision of the product that needs to be done. This approach was successful for decades, up until now. Even managing the "time, money, quality" formula properly is not enough to be successful, no matter how good you think the product turned out to be. Innovation clashed with legacy and product steadily takes the place of the project. inVeritaSoft will review these mentalities, find their differences and see how well they fit today's market and the understanding of success. This mentality has become the talk of the town: some enterprises try to adopt it, others choose to remain legacy. With the vast variety of tasks that include fresh product release or maintenance of an existing one, each choice may seem right under given circumstances. It would be worth it to break down each mentality and compare their usability when trying to reach commercial success. As was said earlier, project-oriented mindset has been around for a long time and was indeed good at what was required of it. Three main principles shape this model. Project scope. A clear vision of an end product, its functionality, the value it needs to bring to the clients. Time. Set estimates which must be followed to succeed. Concept creation, development, QA - everything works together to be there on time. Budget. Whether it’s an outsourcing project or an in-house initiative, project thinking means that there is a precise amount of money to spend and going over the limit would not be preferable on both ends: the client and service provider. Now, don’t get us wrong. Project thinking still works incredibly well, just on a different level than it used to. The use cases of this mindset are plentiful and deserve a closer look. When there is something that already works and brings value to the customers, a bunch of set parameters and a clear idea is all that one needs to set up a smooth, relatively failure proof process. Every gear of the mechanism is focused on doing its part so that the project will be complete and, say, the software receives a much-needed update to remain competitive or improve usability and user experience. Everything within this process works on a local scale and project thinking benefits it the most. You own a software development firm. Your sales department gets a request to build a mobile app, and you settle all estimates, budgets, client's vision, etc. Your project managers start working their magic, using the most suitable approaches to fulfill the essential law of business: underpromise and overdeliver. Their project mentality fits excellently to the given set of circumstances, and the outcome is your local success - contract complete, payment received. Here’s what we’re trying to tell: project thinking becomes much less useful when it comes to broader success. Product thinking is not about local, but about global and grand. Why project thinking alone is not enough for a significant market victory? The mentality itself became only an auxiliary force to help a company reach success. The modern world is so dynamic and innovative that even perfectly completed projects may result in a catastrophe: market share lost and customers turning to competitors. Some factors explain such paradox. Technological disruption. Rapid innovation may cause unwanted surprises in the face of superior technology that your team is using. If the competition adopts it, their product will be better and more desirable for the target audience. It won’t matter how good the product is if it’s already obsolete. A dynamic understanding of value. Value is the crucial part that defines the user experience. The product must solve the issues of the customers and satisfy their needs. In an ever-changing market, the needs of customers change constantly. Project thinking with its set budgets, scope and time estimates may not be capable of responding to that in time. Digitalizing world. Making progress in a project-to-project manner may leave you behind on the new market rules to abide. By the time your project gets completed, the target audience becomes more digital and goes mobile, losing interest in what you have to offer. All these factors show that project thinking alone may be amazing to achieve the set goals, but to remain dominant in the market and improve on a continuous basis, something bigger and broader is required. While project thinking has almost a tangible feel to it, product thinking is aimed at considerable and sustainable success. It may be described as designing a product so it would last for years and add to its value and improve UX gradually. What problem is my product will solve? How can I make it valuable for customers? How do I design the UX to be amazing? How do I sustain the value? What outcome am I expecting? The last two questions are the primary difference in project vs. product mentality. Success is when your solution remains in high demand and satisfies an equal amount of users' needs. The technology and change of evaluation continually disrupt the markets. Thinking about the product means being ready to respond to that. If there has emerged a new technology that works better than your developments - innovate. It is crucial to find ways to innovate by adopting new techniques to make the solution even better (faster, more comfortable, more straightforward, choose any). 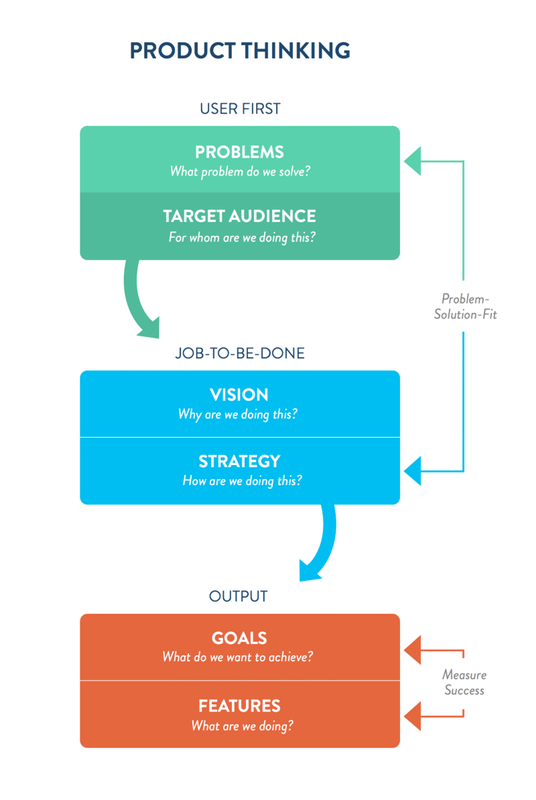 Instead of a cliche project mentality pattern that focuses on the idea and the completion of the project, product thinking requires one to answer the “What’s next?” question. Rather than focusing on finishing the project, it is now more important to think of the outcome you want to achieve. This thinking pattern unlocks more opportunities and possibilities. There may be perfect innovative APIs to boost your product, for example. 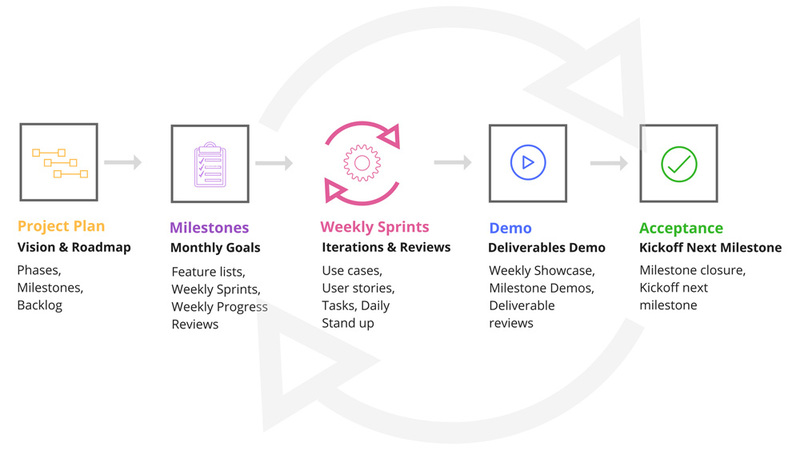 Product thinking offers freedom to think outside of the single project’s lifespan, making you one step ahead of the competition. In the hierarchy of success, we would put product mentality higher up than the project one. Thinking about solving the problem and the potential outcome allows creating a strategy with built-in agility. Such approach allows to respond to disruptions swiftly and to come out on top in the end. Project mentality is perfect for reaching small objectives and building on existing progress. It makes the team work like a clock to get the development phase done. A smart combination of the former and the latter is an optimal strategy for dominating your niche and reaching the set target on time while being able to protect the progress from external factors. Have unanswered questions? Don’t know how to choose a correct strategy to breathe life into your new idea? Contact the team of experts right here. We’re one click away.